Freedom! Driving on country roads can be fun, often with an empty lane ahead. Great chance to blast your favourite Spotify playlist and put your foot down a little, right? Well, country roads are the most dangerous roads to drive on – especially at night. According to THINK!, 60% of all fatalities in the UK occured on rural roads in 2018, and based on our internal driving data, drivers who speed between midnight and 7am are 3x more likely to have an accident than drivers who only speed during the day. That’s a dangerous combination. 1. Speed limit – it’s a maximum. Country roads are unpredictable. Our customers who speed on country roads are 30% more likely to have an accident. You might know the road like the back of your hand, but you never know what’s waiting around the corner – animals in the road, a slow tractor or cyclists. We have thousands of rural roads and instead of individual limits, most of them have been assigned a general limit of 60mph. But this only gives you the maximum – you can drive at that speed, as long as the road is safe. You need enough thinking and braking time, within a distance you can clearly see ahead. At night time, this should result in you lowering your speed even more as the visibility is poor. 2. Slow vehicles – patience is a virtue. You might end up “stuck” behind a slow moving vehicle, like a tractor, many times on a single journey. It’s safer to avoid overtaking on rural roads, especially if you can’t fully see what’s coming in the other direction. Curvy roads, blind bends, overgrown hedges combined with darkness – not a safe manoeuvre! But sometimes you have to, we get it. The worst thing to do is just “wing it” – make sure you’ve read the road ahead as best as you can before making a move. Overtaking also requires you to stay within the speed limit; if you can’t, you shouldn’t go ahead. 3. Other road users – sharing is caring. Country roads tend to be narrower and might not have the broken white middle line. Rural roads are often low in traffic but you’re likely to share the road with animals, tractors, pedestrians or cyclists, which requires you to drive slower and in some cases pull over, or even reverse into a layby to let someone pass by. Keep an eye out for road signs. Road signs can warn you about animals and other hazards, so it’s important that you’re familiar with them, especially on country roads. 4. Weather – friend or foe? When we think of casual country rides, we usually think of sunshine with a soft breeze. It’s a very different experience on bad weather though. Being on the road in challenging weather, especially in the dark, can be very dangerous. If it’s been raining, the roads might be slippery with wet leaves on the road, causing your tyres to lose grip. Ice or black ice is likely to form on country roads in the winter, creating a serious hazard. Driving sensibly, reducing your speed and keeping a good distance between road users ahead and behind you will help when driving in difficult conditions. 5. Lighting – pretty essential. It’s hard enough driving on country roads at night – you need your lights! Make sure all your lights are working perfectly, including: side lights, headlights, full beam, fog lights and brake lights. Not only is it a necessity, but it’s also a legal requirement. 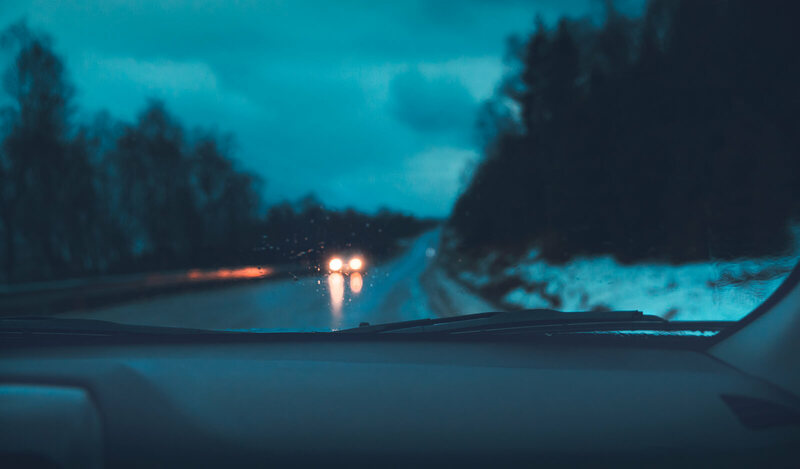 Driving on a rural road at night with only one headlight working, for example, can cause a distraction to any oncoming traffic. They could potentially think you’re a motorbike and not leave enough space between you, leading to an accident. It’s important to consider other road users when driving at night. Your beams need to be dimmed when passing other cars, and it’s distracting to have your interior light on. There you go – adjust your speed, stay patient, consider other road users, prepare for the weather and maintain your lights. Just keep these five things in your mind next time you’re driving down a country road late at night.